BSET EQ is the exclusive Representative for Midas Technology in Northern California and Nevada. Defective Hi-Rel circuits (such as aerospace hybrids, MEMs, optical devices and other complex microcircuits) can't legally be repaired, but they are expensive to scrap. "Rework" uses proven, qualified processes to rebuild circuits into their original, as-new condition. This saves critical time and money that would be required to replace them. Restoring a defective hi-rel microelectronic circuit to its original specifications - in function and physical condition - is termed "Rework". This can be difficult, because packaged microelectronics are complex and subject to many manufacturing restrictions. In many cases, they are not designed to be reworked. Rework is NOT the same as repair, which restores function but may change physical specifications. So why not just repair defective parts? Because it is not allowed. Many high reliability applications prohibit repaired parts, because it is not possible to confirm they will meet performance and durability limits. Genuine "rework" promises parts that are good as new. Any common milling machine, belt sander or saw can eventually remove a package lid, but rework-certifiable de-lid processes require much more precision and package protection. 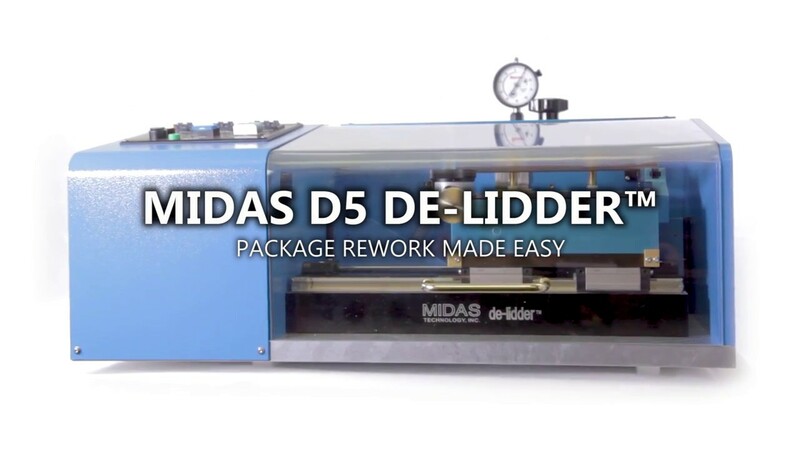 For 30 years our de-lidder™ machines have been the industry's state of the art solution for removing lids from hermetic packages. Our systems are designed for cleanroom use, by cleanroom staff - not skilled machinists. Our process uses special high-speed tooling, set up to machine through lid flanges from below. Particles are kept out of the package cavity by tool and lid geometry, gravity, and vacuum. The photo at right shows a package wall after machining. The silvery side shows where a thin layer of nickel was melted between the package wall and lid flange. Our de-lidder™ machined through the lid flange right to this nickel, releasing the lid. The gold beside it surrounds the package cavity holding the circuit - note that the gold plating there is untouched - so it will hold the new lid at exactly the same height as the original. During the reseal process, our machined surface tool marks help to spread nickel along the package wall, improving hermeticity - there is no need to sand the package after removing the lid, no extra cleaning. 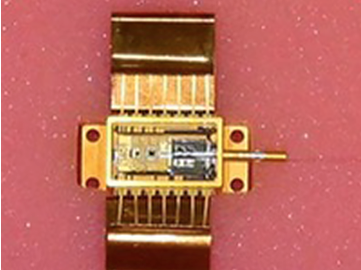 "D5L" linear models are for rectangular packages with leads under 1/2" long, such as traditional hybrid circuits. Our standard D5L6 accommodates packages with sealed edges up to 6", the D5L8 up to 8". "L" fixtures are usually higher than others, with cutting room underneath for thicker lids. "D5F" fiber models were developed to protect long fibers on optical packages. They are bigger, heavier machines because they offer more clearance around the worktable, and can handle longer package tubes and other extensions. "F" fixtures are lower profile, so more package features will fit above them without modifications. "D5R" rotary models have a motorized turntable and use the proprietary de-lidder™ milling system to remove caps from round packages and headers. The D5R3 is a dedicated rotary machine, while the D5RT is a turntable module option which can be added to D5L models so one machine can do both rectangular and round parts. devices in the package will break down if they get too hot. For many years, manufacturers simply limited rework temperatures to 150°C, intended to keep processes within thermal limits. The only problem was, this didn't work. 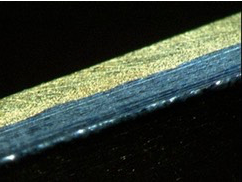 Conductive epoxies designed to hold die onto circuit substrates took a long time to break down at 150°C, and in some cases just became tougher and tougher. So operators were left with one option- chipping away with chisels and screwdrivers while their products slowly baked. 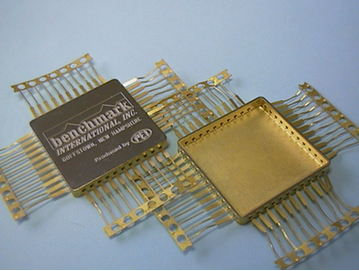 In the mid 1980s, Midas Technology worked with AT&T Microelectronics on a new approach - HOT Gas Rework. This revolutionary approach used much higher temperatures delivered for a very short time to break down die attachments, without overheating adjacent devices. We introduced this process to industry in a series of high-powered machines, culminating in today's fifth-generation HGRS-V. 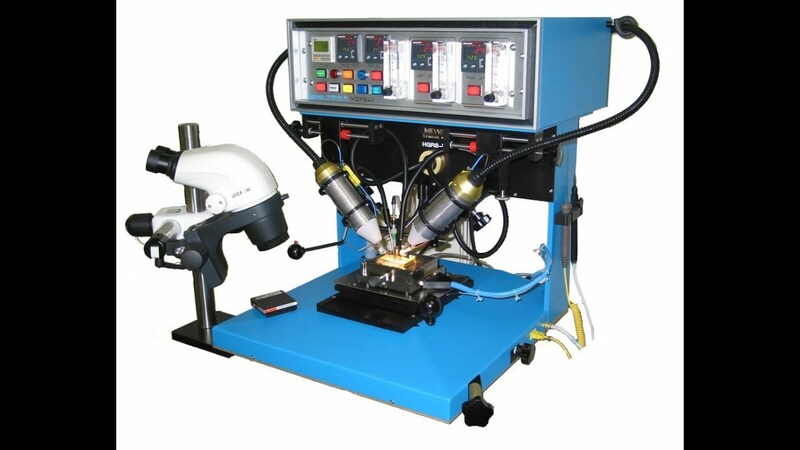 The HGRS-V is a highly adaptable dual-jet "thermal workbench" with a comprehensive suite of circuit-protective features. It's the ideal solution for those facing a variety of rework tasks involving large die, eutectic attach, double-sided devices or other assemblies with tight thermal constraints. 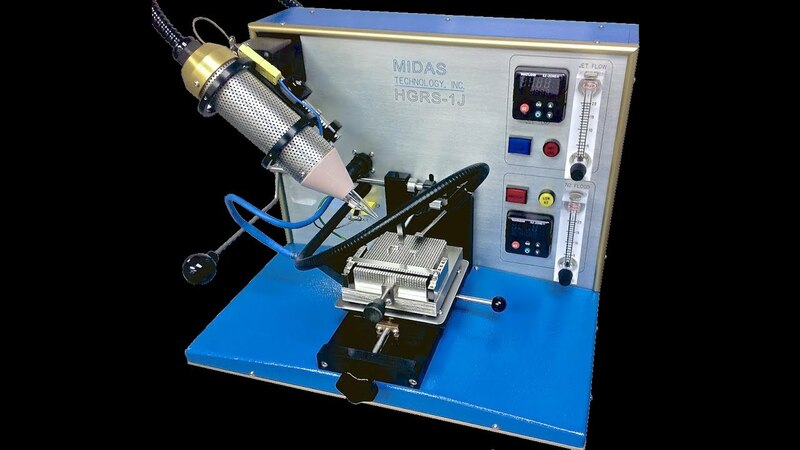 The HGRS-1J is a compact, economical single-jet tool giving high temp performance without "the extras". This is a great solution for specific applications (thermal test, fiber attach, small die removal) and for labs needing more thermal performance than air heaters can provide.